...and it was for the kids. 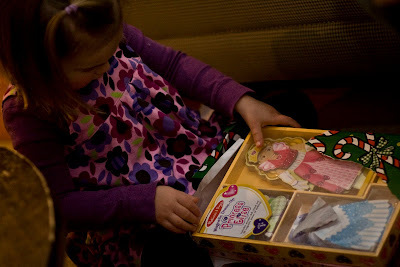 It was a set of gifts from Little Miss' birthfamily. How sweet they are! Both kids were so excited to open their first gift of the Christmas season. E even stopped playing Guitar Hero to play the new game he got- ZINGO. It is definitely a welcomed addition to our limited game collection. We've been playing Chutes and Ladders multiple times a day for the past 2 weeks! Little Miss was also quite thrilled with her magnetic dress-up dancer and princess. Thank you birthfamily...we love you!